I'm still in the thick of things here. It's almost 4am and I'm still busy preparing for Stitches & Craft. And drinking copious amounts of green tea with mint. It's keeping me awake. At this stage it looks like sleep will have to wait until tonight. But I have this terrible vision of me snoring, mouth agape, on the one hour flight to Melbourne! 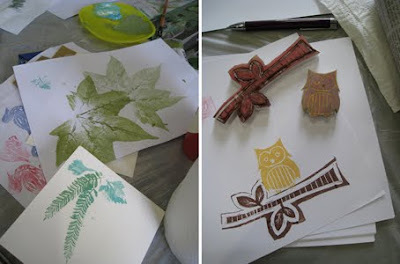 My weekend was lots of fun, with the Notebook Craft Room on Saturday and Mathilda's Market on Sunday. 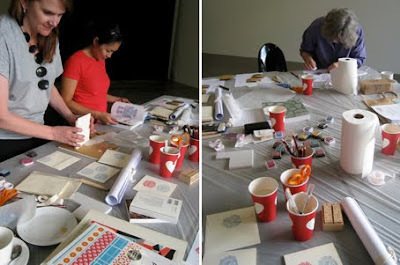 The hand printing class I ran for the Craft Room was really enjoyable - the gals were so lovely. I felt like I was hanging out with friends, not teaching a class. 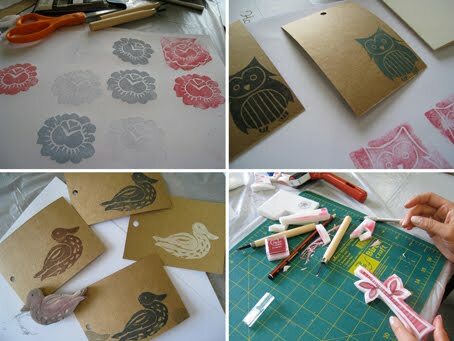 There'll be another hand printing class in the next month or two. No date has been set as yet. I'll let you know when I do. And Sunday at Mathilda's was busy and successful and I got to catch up with lots of lovely people: other crafty lasses with stalls, shoppers and blog readers. And I got to hang out with Roxy all day. She was such an eager helper and loved skipping around visiting the other stalls. She especially loves Sarah's softies, and I spoilt her with 3 of them! A pear, a strawberry and an angry cookie. They have now been reunited with previous purchases from Sarah: an apple and another cookie (who's not angry). 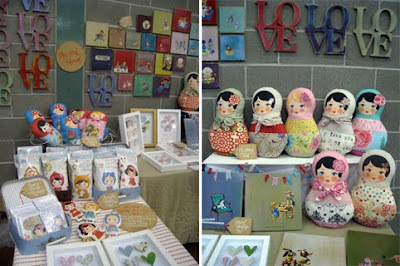 My stall at Mathilda's. All but one of the Ooshka's went to new homes. My apologies for the lack of links in this post... I still have a mountain of mail to open and bills to pay. As well as things to finish and pack. So I'm feeling a bit lazy. There are links to The Craft Room, Mathilda's and The Stitches & Craft Show in my previous post if you're curious. If you're in or around Melbourne in the next 5 days come along to The Stitches & Craft Show. It really is going to be fantastic. Support craft and support those who are supporting us (that would be the Show organisers). Jodie wrote an excellent post about the show and this circle of support, so pop on over to her blog and read it. I'm not sure that I'll be posting again until I get back home on Monday. I need a break. After a few weeks of very late nights, I'm looking forward to making some deposits into my sleep account. See you at the Show? Just give me a nudge if something on my stall takes your fancy or if you want to say hello. I'll try to string a sentence or two together.